Constructed using sinuous spring no sag soft edge support construction combined with luxurious feather cloud fill consisting of foam core, channel filled with 45% feather, 5% down and 50% fibers. Upholstered in "Denim White" 100% cotton. Choose from a variety of linens or cotton blends at no additional cost. Swatch samples available on request; sample will be mailed for approval before order goes into production. This is a custom made to order sofa. Please allow a 10-12 weeks lead-time; deposit required, all sales final. Fabric is not treated with Scotchguard™. Designed and hand crafted in Los Angeles; Lifetime warranty on frame. Customer's Own Material option available for an upcharge - 18 yds. required. Please contact us for details. FSC certified Maple hardwood frame. 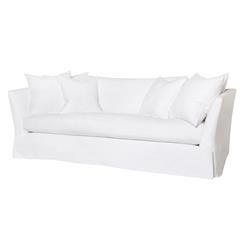 The breezy attitude which works so perfectly in Coastal Style interiors is gorgeously embodied in this sofa. Wide, welcoming arms invite you to curl up with a book, while the kick pleat bottom keeps things stylish and tailored. Upholstered in denim cotton, this sofa can also be covered in whatever fabric you choose. The possibilities are endless and the guarantee on the frame is for life. Includes: (2) x 26 x 26; (2) x 22 x 22; (1) x 40 x 20 x 3 feather down loose back cushions included. Slipcover can be removed for cleaning- dry clean only.